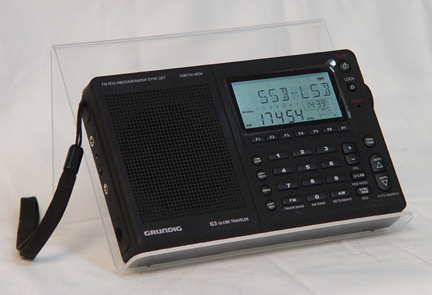 The Grundig G3 Globe Traveler is an innovative portable radio covering long wave, AM, FM (stereo to earphone jack), continuous shortwave plus the VHF aircraft band. It features dual conversion AM/SW circuitry for exceptional sensitivity and image rejection. It offers S.S.B. - Single sideband reception. It has an large 700 channel memory system with memory scan and auto tuning storage. Memories may be labelled up to 8 characters. Unlike other portables in it class, the Globe Traveler offers Synchronous Detection. This special feature addresses the issue of selective fading and adjacent channel interference on shortwave. RDS (radio data system) shows FM callsigns, artist, song title and messages when available. 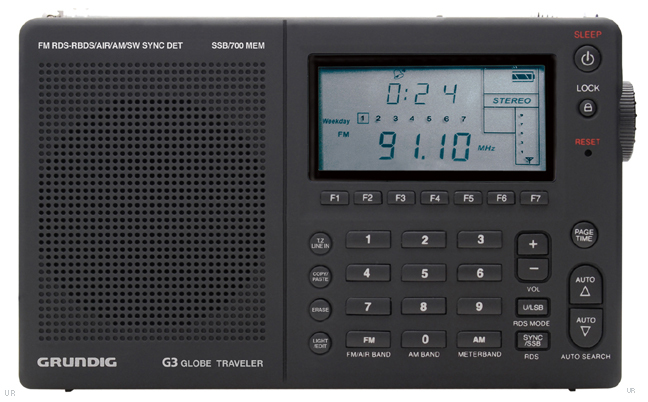 Other enhancements include: Wide/Narrow selectivity, Local/DX switch, direct frequency entry, signal indicator and 24 hour clock with four alarm timers. External antenna jack for shortwave, FM, VHF air band. 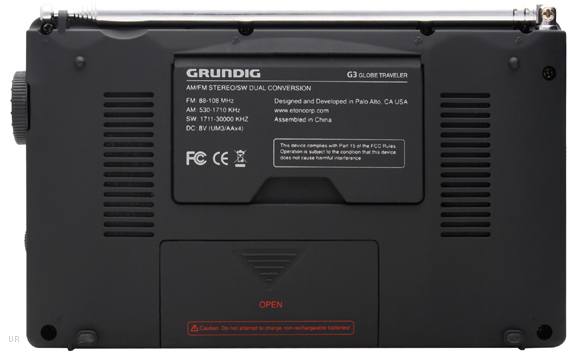 The right side of the radio has a 3.5mm Input/Output jack. Requires four AA cells (not supplied). If four NiMH AAs are inserted, they may be recharged inside the radio. 6.62 x 4.13 x 1.1 inches. Supplied with manual, protective pouch and AC adapter/charger. The G3 is easily our best selling shortwave radio.